Baltar calls for an Investigative Committee (Politics 5); this rolls back the check and we need to start over. Contributions need to be made in order, face up in the thread. If it is not yet your turn, you may PM me your intended contributions (along with any conditions that would change those contributions). Still need contributions (or confirmation of non-) from the Chief. Ok, so the Chief and Boomer can just kick back and relax. Yep, I won't contribute any cards. We've hit the goal, yes? I won't contribute any cards. Chief, you need to go last. It's important to maintain order under IC. Besides, if an unknown cylon is stupid enough to try to sabotage this check, you'll have to counter it. I was last. Everyone else has contributions in Darian's list. Edit: I'm pretty sure some people made their contribs via PM and Darian just posted it. And by some people I mean just Adama I suppose. Jump is now possible with risk of major population loss. Starbuck, you're locked in a cell. What do you do? There's no damage to Galactica. Just to be certain, do we really have 2 raptors left? If so, I would consider scouting. I'm open to suggestions for what to scout. But just to be clear, I will either scout or do nothing. There are indeed only two raptors left. Additionally, the destiny deck is now being rebuilt; there will be a new destiny deck for the next check. Edit: This also required me to reshuffle the Piloting deck. I strongly recommend against risking more than one raptor. There is a decent chance we will need to scout for more fuel during our next jump. Chief, we are at distance 6 and have 4 fuel. Unless you forsee losing fuel through other means, this should be plenty. We can lose fuel through crises (usually involving a choice; and I can always use my OPG to get rid of that crises if we want) or through civilian ship losses (I believe there is one - or possibly two - ship with a fuel loss), so the chances of losing more fuel from things other than jumping are not that large, unless I'm forgetting something. Assuming the admiral is a human, we have a good chance of only needing two more jumps. Ideally, we want a 2 distance destination with at most -2 fuel. This leaves us some breathing room in case we get unlucky with crises or civilian losses. The second jump to win will not require any fuel (correct?). Scouting the destination deck seems like a good idea. Whether you trust Me to do it or not is up to you. There isn't really much else for brigged humans to do other than XO'ing someone and I'll tell you right now that that is not an option I am considering. I should remind you though that Boomer was very clearly not a cylon pre-sleeper phase (she used her OPG to help with the Legendary Discovery). Whoever sabotaged that skill check a while back is still running loose out there. You better do something about it soon while you have some breathing room (and I say "you" because I can't brig anyone from my location). Is it true that we can run out of fuel on our final jump? That makes it less of a concern, then. And I didn't say I trust you to do it, I was just thinking out loud. Edit: And as long as things keep breaking I can't really brig anyone. I have to fix them! The final jump to Kobol is made without drawing a location, and therefore does not use fuel. 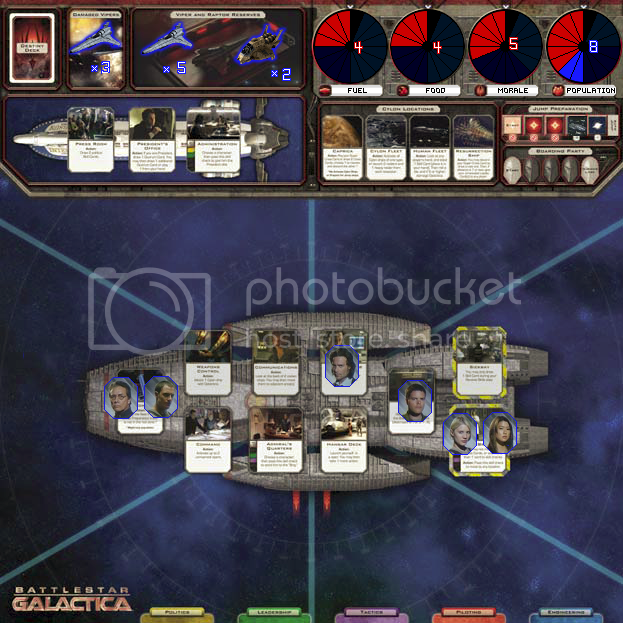 Chief, brigging a cylon is more important (in most cases) than fixed a damaged location. You can always be XO'd by someone on a subsequent turn to take care of repairs. I'll wait another couple of hours before taking (or not taking) my action to give other people time to voice themselves. I suppose if I was going to choose not to take an action, I could activate the brig just to reveal the two destiny cards. That's true. I think fixing the armory while there was a centurion was a top priority, but if something less important happens, sure. You also need to get to work convincing people to bust you out. I don't want to see three of the crew in the brig at the same time, that's just asking for trouble. Getting out of the brig might be a good plan, but I don't think I can really help. Scouting the crisis deck might be a good idea to get some more jump preparation for Helo's turn, barring that. Scouting for jump prep would be useful under any circumstances, but I'm not planning on forcing a jump during my turn (barring some emergency from the Crisis). No direct threat right now. I agree, Chief, that fixing the armory was the right move. Chief, what do you think I was doing before I was brigged? I was never given a good reason for being brigged. Just accused of proposing non-optimal plans, which other people followed of their own free frakin will. Nevermind that I kept pushing the civilian ships out of harms way. The President knows what was in those ships so he is well aware of the fact that it was important to keep moving them away (and to keep them together). Yet he still chose me to brig. All that yakking and look what it got me. I'll just sit tight in the brig and help however I can. If someone wants me out, then it's up to them to speak up and do something about it. I don't know what else to say. Helo, what are your plans for next turn? I agree that at the moment, it doesn't look like you'll need to force a jump. True, no imminent threat... so a destination deck scout makes more sense in this scenario as well, huh? Oh, and Chief, my comment about brigging cylons being a higher priority (in most cases) than fixing things was not intended to be applied to your previous action. That was definitely a higher priority. My comment was a general one. Scouting the destination deck (I finally actually didn't mistakenly call it the destiny deck for once). Activating the brig just to reveal information about the destiny deck that may be helpful to us on future skill checks. Unless I get a roaring of support, I'm not actually trying to bust out of the brig by doing this (i.e., you don't need to waste any cards). I'm uncertain as to whether or not this is actually a good idea since it would also be giving information to the cylons. I don't think you should try to bust out unless you're sincerely trying to get out. I'm willing to give you a hand with that, though. Most likely scout or give someone an XO, depending on my card draw. I won't have a Crisis to respond to, and there's no need to jump. Though I am tempted to head to Colonial One and run for President. I'm questioning why Baltar hasn't used any Quorum cards. Chief, I'm not trying to bust out. I'm just throwing that out as an option if we feel like gaining the extra information about the destiny deck would be useful. So don't throw any cards into the check if I activate the brig on this turn (unless of course someone else truly wants to break me out). That's what I mean, don't give the cylons the extra info. If all you've got is scout, then scout. I want to hear what the admiral has to say. Frankly, I find it a little annoying that people sign up to play an interactive game with other people and then don't interact. He's had almost zilch to say about anything. Maybe a brigging will get him to be more interactive. Helo, you wanna be admiral? Besides, I'm considering scouting the destination deck and want to know what he thinks I should scout for. I wouldn't seek the Admiralty because, at this point, I don't distrust the old man. Though I do wonder why he hasn't used a nuke yet. As for the destination, we have to be careful about anything which puts Food at risk. If I remember, there are some destinations which allow us the chance to get more food, and that would certainly be worthwhile. You know You wanna be Vice President, free booze and interns. I'm not terribly worried about the destination deck at this point, but if you want to scout it go for it. Scouting the crisis deck could be a waste, since we still have some valid options if we encounter a really bad one. As for the nukes, I don't actually mind that we still got them. Could come in handy. Try to scout for something that allows us to regain a crtitcal resource, at least two distance is also a must have. If we have to risk something morale or population are our best bets, but we could also go with fuel if we have to. You forget, Mr. President, that I am a paragon of moral rectitude in a galaxy of shifting ethical standards. Plus, I'm banging Athena, and I really doubt any of your interns would be an improvement. No Strategic Planning this time.